Call Destinations refer to the User, Email, Group, Phone Number, or Call Flow where you intend to route incoming calls. In order to accept incoming calls to your Telzio phone number, you must set a Call Destination for the number. In this article, you’ll learn how to set up Call Destinations. Before you get started, you’ll need a phone number on your account. Learn more about Getting Numbers and Porting Numbers. Navigate to the Plans & Numbers page. Click on the Number or Plan to to open its settings. Click on the Number within the plan to edit its inbound call settings. Choose a Destination from the drop down list. No Destination – Calls will drop when they reach your phone number. 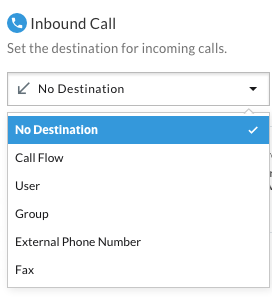 Call Flow – Calls will be directed to a Call Flow. User – Calls will be directed to a User. Group – Calls will be directed to a Group. External Phone Number – Calls will be directed to a non-Telzio phone number. Fax – Converts this phone number into a fax line. Specify the Destination based on the previous selection. Your calls will now be routed to the specified Call Destination.